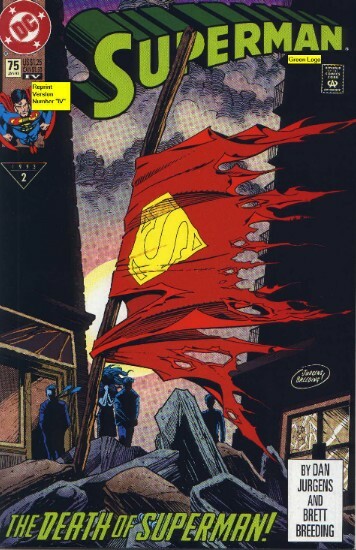 The Good: The death of Superman, or any mainstream character, is worthwhile reading, if only for the sheer impact it has on the comics universe and on pop culture in general. 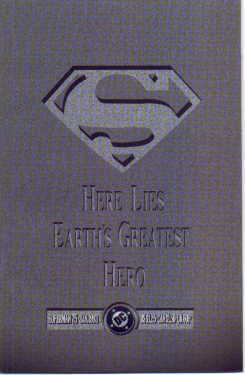 Superman's death in this issue was what a good hero's death should be: heroic, yet tragic. The Bad: Doomsday. As a believeable, likeable villain, I felt he had much lacking. He had virtually NO character development (over 7 issues!) and his powers were vague at best. It would have been interesting to give him a power like Titano's Kryptonite vision, to at least make him interesting. The Bottom Line: Even though you can usually only find the reprints (reprint IV shown here, to the right of the original cover, above) in the quarter bins, it was the story that was important... and the reprint cover is, IMHO, better than the original anyway!